Some prepositions are easily understood. 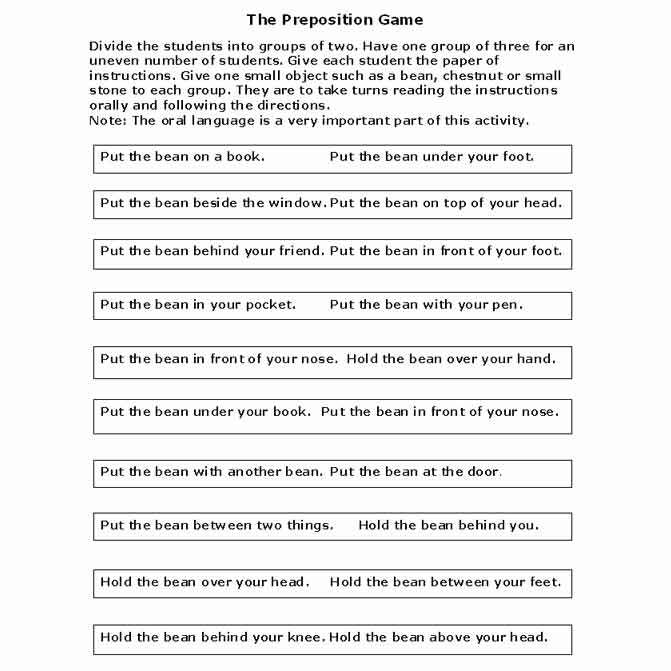 Preposition Game – Print this page. Under – The dog is under the table. Beside – Beth is beside her friend. Behind – The house is behind him. With – The boy is with his friend. Between – She sits between her mother and father. In front of – The children are in front of their parents. 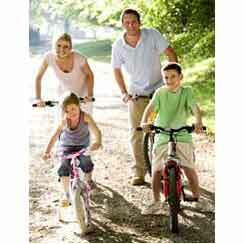 They ride on their bicycles. Others have more than one use. On indicates that something is placed on top of something else. On also indicates a specific day. His birthday is on May 12th. She meets her friends at the Chinese restaurant. They meet at 8:00 o’clock. Oral Questions – Print this page. In indicates that something is inside another thing. The gift is in a box. In is also used to talk about when something happened. Of is often used in a phrase to show a relationship between two things. Her dress is made of cotton. Over means that something is covering something else. Above means that something is higher than something else. This is all very boring and confusing to students. They can’t consider these rules as they speak. Let’s give them the samples for reference. Then the best way to help them is to provide activities where they are using prepositions to interact with each other.